A few simple steps can help you protect your children from poison. (NAPS)—Children are naturally curious, move quickly and explore the world with their mouths. And we all know: they have a tendency of getting into things they shouldn’t. In observance of National Poison Prevention Week, take the necessary steps to ensure your home is a safe place for your little ones. Install Child Safety Locks: Your kitchen and cabinets can often be a playground for your children. As they create musical instruments out of your pots and pans, they could also be exposing themselves to danger. Be sure to keep all household cleaning products and sharp kitchen utensils in cabinets and drawers with proper child safety locks. 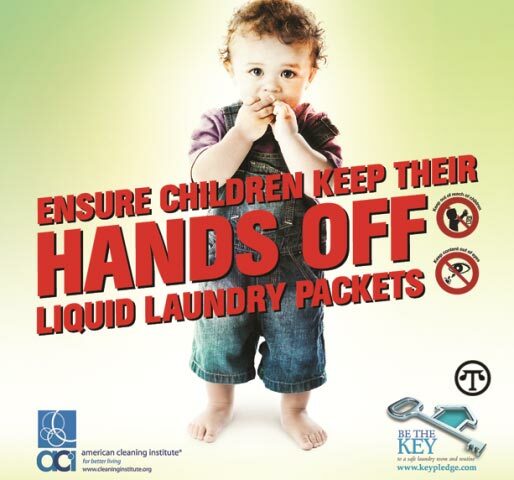 Ensure Liquid Laundry Packets are HANDS OFF for children: Liquid laundry packets are harmful if swallowed or if they get in the eyes. Children should never handle them. Like any household cleaning product, laundry packets should be stored up and out of reach. You can help prevent accidents by always storing laundry packets in their original container before, during and after each use. The American Cleaning Institute® (ACI) is inspiring action among parents to take charge, handle and properly store laundry packets. Visit www.cleaninginstitute.org/hands-off/ for more must-have, critical information on laundry safety. Check Everyday Items for Potential Hazards: Children act fast and are naturally curious. How many times have you caught your child going through your purse? Remember that all purses and bags could be home to potential hazards including medicines, devices that contain button batteries, pen caps, safety pins or hard candy. Always be aware of where you keep these items ensuring they are out of reach of young children. Keep the Poison Help Number Readily Available: Be prepared. Accidents can happen in an instant. Take the time to ensure the Poison Help number is readily available by adding it to your home and cell phone (1-800-222-1222). Keep this number in a visible place in your home, such as on your refrigerator where family members, babysitters and caregivers can see it. It is just as important to be prepared for an accident involving poisons, as it is to take the necessary steps to prevent them.